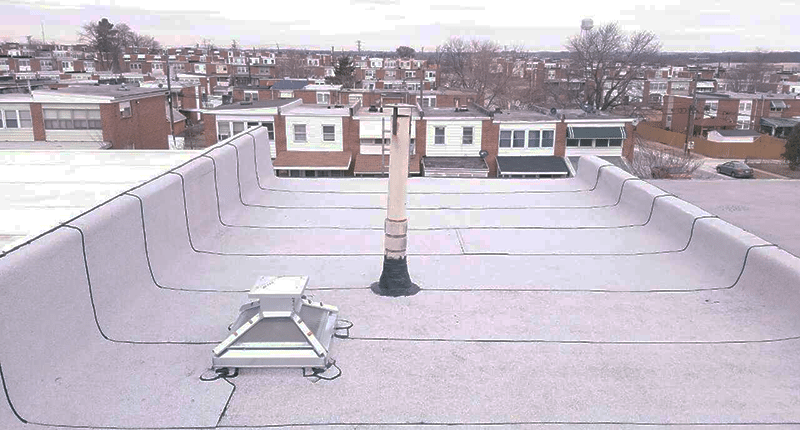 We have completed repairs and installations on hundreds of flat roofs, making us arguably the most experienced flat roofing company in Baltimore. We service homeowners throughout Maryland who are looking for flat roofs, something we consider one of our many specialties (flat roofing projects are a large percentage of our business throughout Maryland). A flat roof is a unique and efficient architectural design that requires special care from a licensed and professional roofing company. Many local contractors and handymen sometimes claim to be "jacks of all trades." However, most times, they're not, and having an inexperienced contractor doing work on your roof could cause worse problems in the long run and more expenses for the owner. Our Roof Inspection Specialist will determine the type of service your flat roof will need and what material is best to use. Some flat roofing services are suitable for both residential and commercial roofs while others are best suited for large commercial projects. Each has its own unique set of advantages, which we’ll discuss further down. Be sure to ask our Roof Inspection Specialist about the full range of treatment options available for your property during your no-hassle consultation. Considered to be the “world’s best roof,” this roofing material is custom-made for each roof and is made from single-ply PVC material. It is not only long-lasting, but it also is very low maintenance so you don’t have to worry as much about it compared to other types of flat roofs. They’ve been in the roofing business for 40 years, so you know you can trust them and their results. If all or part of your roof is a deck, then this is the best choice for you when it comes to flat roofing materials. Duradek is the industry leader when it comes to waterproof decks, including those that also function as roofs, providing you with a great place to relax without worrying about any water coming through to your home. Available in both white and black to suit your needs and preferences, ethylene propylene diene terpolymer (EPDM) is a synthetic rubber which is popular for several reasons. It is extremely durable so it will last for years to come. It’s also leak-resistant because the rubber expands and contracts with the temperature changes and the adhesive keeps it bound tightly to the roof. One of the more economical flat roof solutions that’s still durable is thermoplastic olefin (TPO). They are economical because they’re cheaper to install compared to other roofing materials, but also because they are energy-efficient and can therefore save you money on energy bills every month. It also comes in several color options so you can match it to your home. This type of rubber roofing material is great for Maryland weather because it’s able to expand and contract as needed to keep every crack in your roof sealed tightly. This helps to prevent leaks and potential problems due to leakage. It gets its name from the way it’s installed using torches which is what helps the material seal your roof up tight. One of the easiest ways to decide is to have our Flat Roof Specialist visit your home to inspect the roof and give you more details based on your unique home needs. Call us today to arrange an appointment. Keeping your flat roof maintained will ensure that it will last for years to come. We can provide you with regular maintenance to make sure small problems are caught and repaired before they become big problems. Flat roof maintenance involves several important steps that will make sure some of the most common flat roof repairs are avoided. Leaves, dirt, and other debris can build up in gutters and drains, which can prevent water from leaving the roof. This accumulated water can then damage the roof, which is why cleaning flat roofs is such an important part of routine maintenance. If there are tree limbs that are overhanging a flat roof, this puts the structure in danger. Tree limbs can easily break off and fall during storms, strong winds, or heavy snowfall. If these land on your flat roof, they can do some serious damage which can lead to significant and expensive repairs. When there is moss and other vegetation growing on your flat roof or even along the edges, this is a bad sign. It indicates that water is not properly draining since there is enough being retained so that plant life can take root and grow. Part of our maintenance check will involve checking the inside of your home for water damage. If there are any signs of water damage inside the home such as water stains on the ceiling or along walls, this indicates a roof leak that needs to be addressed. 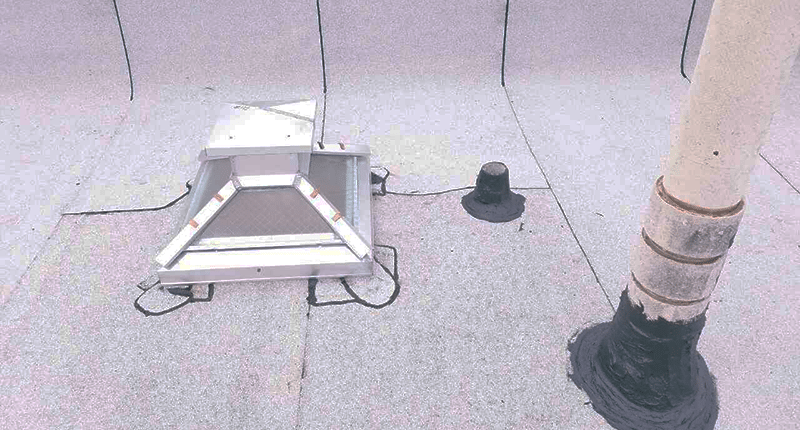 Roof leak repair is slightly different when it comes to flat roofs. This involves fixing a problem that is found during routine maintenance or a roof inspection. Whenever there is a problem with a flat roof, it needs to be addressed as quickly as possible. This is because most problems will worsen if left, costing you more money and potentially putting your home and belongings at risk. This refers to pools of water that form because there isn’t proper drainage occurring on the flat roof. This could be due to a buildup of debris, general wear and tear, or structural damage which is causing the roof to sag in certain parts. When a small crack is formed on the roof from any type of damage, water can get into it. When that water then freezes during a Maryland winter, the water expands and makes the crack bigger. As this process repeats itself, a split forms as the crack continues to grow. This term refers to an event that occurs when air becomes trapped between layers of felt, causing air pockets to form. The air pocket may then break and can then allow water to leak through the roof, making for a dangerous situation for your home and your family. To prevent permanent damage always schedule a check-up in the spring and fall or after harsh weather conditions. These regular check-ups will keep you from costly roof repair so you can continue to enjoy your home or business without the added worry of pricey roofing costs. Just give us a call whenever you want us to come and check if your flat roof needs maintenance or repairs. We’ll provide a flat roof estimate for whichever service you’ll need, and provide as much detailed information as you’d like. Are you ready to install a new flat roof on your home? Are you worried about the current condition of your flat roof? Do you have signs of roof damage that need to be addressed? No matter the issue, Four Seasons Roofing is here to address all of your flat roof concerns! 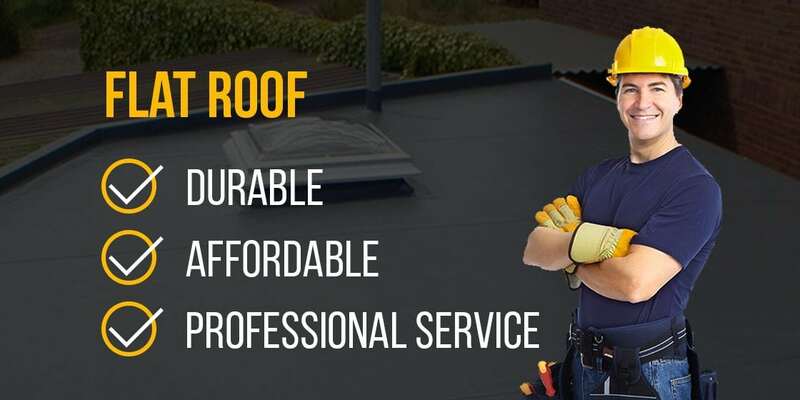 Our flat roof experts are eager to take care of any problems that you might be having with your flat roof. They will also help you set up an inspection and maintenance plan to make sure that issues are caught as early as possible to save you trouble and money. By catching a problem early, we can solve it before it gets worse. For a totally hassle-free, obligation-free estimate, give Four Seasons Roofing a call today at (410) 995-7744. Please provide your name and phone number. We will call you back shortly.